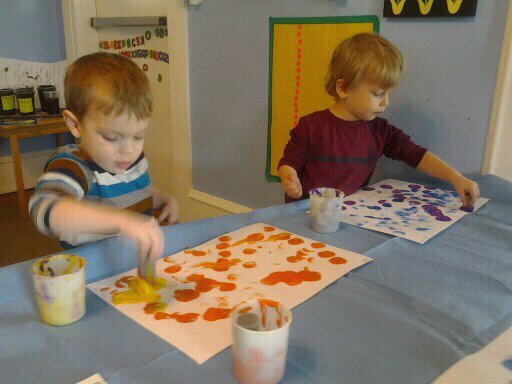 Last week, we explored with contact paper and boy did we have fun! Contact paper was taped to the floor sticky side up. The Ladybugs took off their shoes and socks to explore the sticky situation. The children quickly realized it was harder to walk and balance when your feet stick to the floor! Their muscles had to work harder and soon they got the hang ouf it and the giggles began. When it was time to put shoes and socks pack on, it provided an excellent opportunity to work on self help skills. Rita and Meaghan helped each child by putting thier socks on their toes and then each child pulled their socks up and put on thier shoes. Rita went outside on the porch to capture this image. 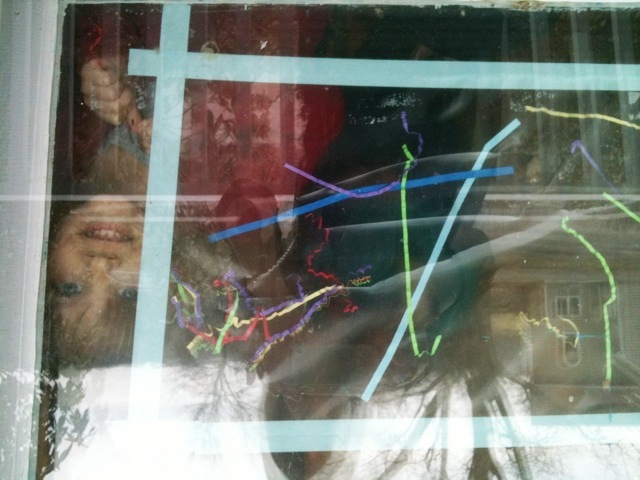 The sticky fun continued as the contact paper was taped to the window and colorful paper strips were set out for exploration. 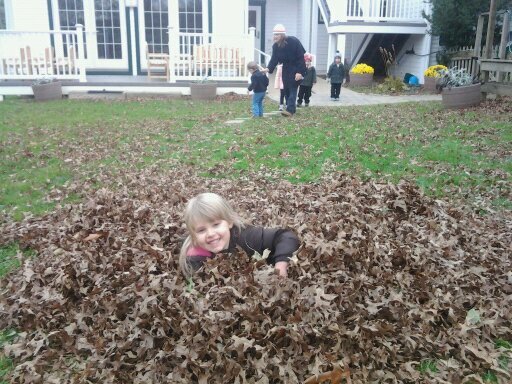 This sensory experience allowed the Ladybugs work on finemotor skills. It took concentration and precision to pick up individual paper strips and stretch them onto the sticky surface. Each child thoughtfully placed the sticky paper and some tried to put big bunches on the surface as well.Our collages are still on display in the room and children from the morning class have noticed and enjoyed the window artwork. Be sure to check it out! All the Ladybugs are all back together again! We are back from Winter Break and the Ladybugs enjoyed coming back to school. Despite a few tears which disappeared quickly, the children jumped back into the routine. Last week, after our Welcome song, we read books about family. We read The Family Book by Todd Parr to talk about how all families can look different, but the one thing we have in common is love. On Thursday, we read a book that featured dads and children playing together. Our Ladybugs then shared what they like to do with their dads. The children drew pictures of their families which came home on Tuesday. 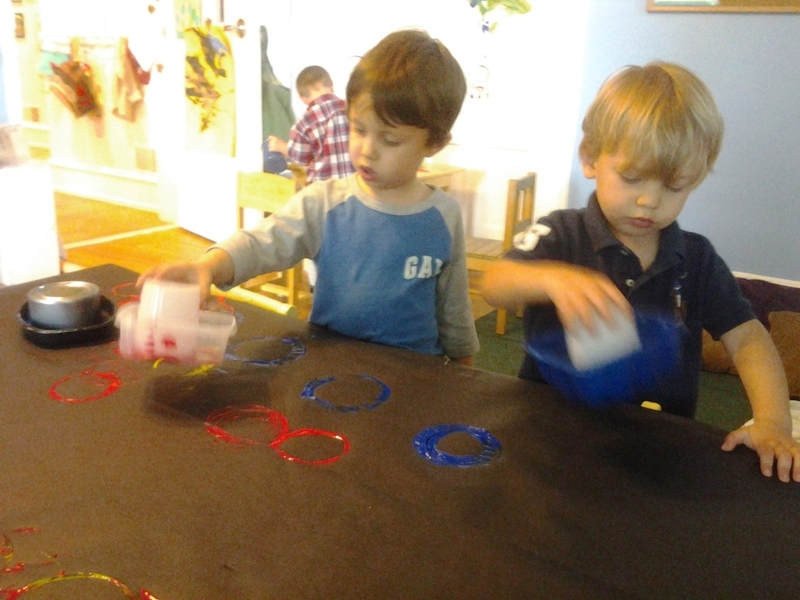 On Thursday, we made colorful circle paintings… Our finished Artwork is on display in the room. Our Ladybug class is learning to say goodbye, be comfortable in a new place, to trust, play with other, to communicate , paint, learn the routine of school, bring down the silence in Meeting for Worship, saying I’m sorry, and all this hard work has led to many…SMILES! This is an exciting time in their lives, but you may not be hearing much about it from your child. 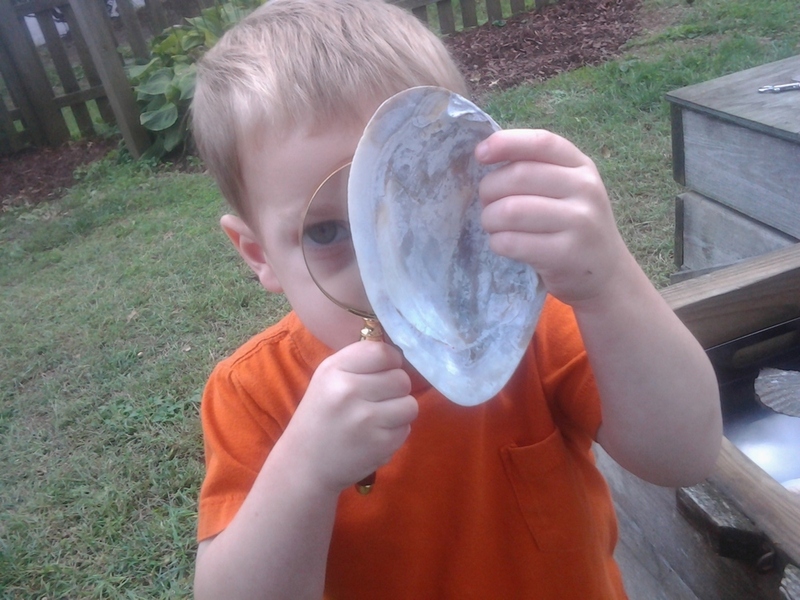 Hopefully, this blog will help you be a part of your child’s new experiences. Morgan and Andrea in the taxi. Have you ever heard of sqeezable water? Your children have. What looks like a simple fun activity incorporates fine motor skills, builds arm strength, encourages social skills and scientific discovery. 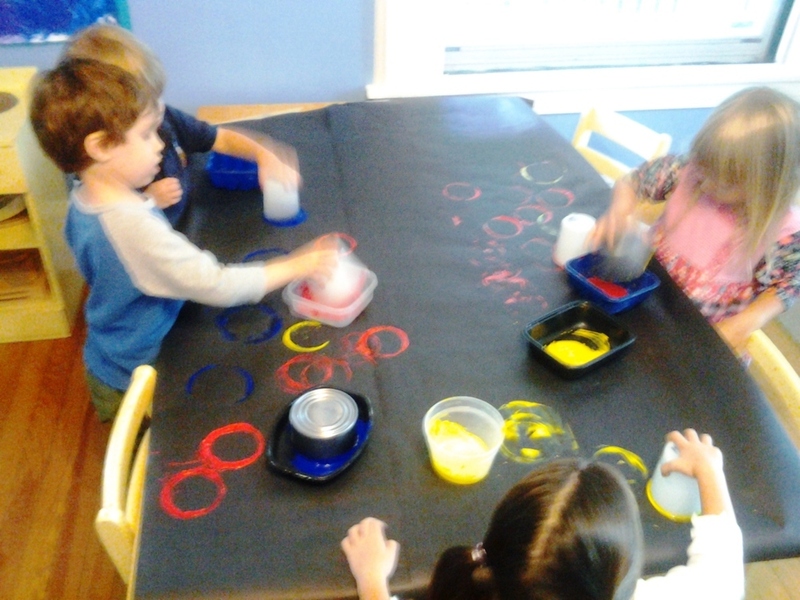 We also did a group painting project in which we painted with cups and round containers to order to print with circles. Little did I know that this activity would be a percussion experiance as well. I wish I had a video so you could get the full experiance but check out the pics.. The Ladybug class has discovered our new Peace Garden. Teachers and children are both enjoying this new place to explore and learn that peace is more than being quiet or saying I’m sorry. Our introduction to the Peace Garden began with a hands-on project The second week of school, we mixed cement, poured the cement into a mold and decorated stepping stones to be a part of the walkway that leads into the Peace Garden. Each class made a stepping stone in honor of International Peace Day. The morning classes, held Meeting for Worhip in the Peace Garden to share all the new stepping stones. That afternoon, we had our first Meeting for Worship in our room. We read the Quiet book, which shows different kinds of quiet, ex: coloring on the walls quiet, dropping your sandwich jelly side down quiet, standing beside a friend quiet. Our First Silence was peaceful and fullfilling. We then visited the peace garden to see all the stepping stones. I look forward to holding Meeting for Worship in the Peace Garden with our Lil' Ladybugs. When we enter the Peace Garden, we spend a few moments to relax; I ask the kids to raise their hands over their heads and breathe out as they bring their hands down to their sides. This simple action tells the children the Peace Garden is a special place and our bodies are calmer as we walk across the stepping stones. The children love the wooden amadinda, the wrench xylophone and the propane tank drum. New benches arrived for the children to relax on and the outdoor easel is popular as well. 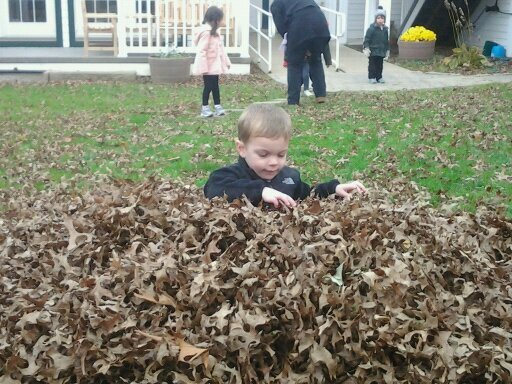 In the center of the garden are several discovery boxes, where the children can build, investigate and create with natural materials.